While introducing my recent book Recovering Democracy in South Africa to launches all over the country I have probed the meaning of the words ‘recovering democracy’. Initially no one questioned what I said but now a few people have taken issue with the word ‘recovering’. At an empirical level I was questioned on social media as to how I could say there was no democracy when we have free and fair elections. Others have suggested alternative words to ‘recovering' in order to better capture what they believe are the problems of the day and a vision of the future. It may be important to take this further as part of an attempt to debate what we see as democratic life. My argument has been that the words recovering and democracy are both ambiguous, first because democracy is not simply ‘no more’ in South Africa. At the same time there is clearly something ‘missing’. We have powerful democratic institutions but these have come under sustained attack. The most obvious assault may be the Nkandla spending which entails a whole range of actions that have undermined democratic and constitutional values, including diversion of public funds intended for the poor in ways that enrich the President. Parliament has itself undermined democracy by refusing to hold the President accountable and the President has failed to engage in good faith with the Public Protector’s report recommending that he pay back a portion of the monies that enriched him. All of these acts and omissions run counter to the oaths sworn by MPs and the President to uphold the constitution. A number of other state institutions that underpin democracy have come under sustained attack, many of these relating to the administration of justice. The first of the President's appointments to head the National Prosecuting Authority (NPA), Menzi Simelane, whose record raised questions about his integrity, was removed following a Constitutional Court decision that he was unfit to hold the position. It took 18 months to replace him but his successor Mxolisi Nxasana also came under scrutiny over whether or not he was fit to hold the office, though the basis for this action did not convince many observers and has been suddenly dropped. Four other leading officials of the NPA are facing charges including perjury and there is simultaneously action being taken by the Bar Council to have them disbarred as advocates – in connection with false charges brought against General Johan Booysen in KwaZulu-Natal and attempts to prevent charges being brought against Richard Mdluli, an apartheid era security policeman who was made head of Criminal Intelligence and is alleged to have used secret funds allocated to crime intelligence to pay relatives and others as ‘undercover agents’. The effective functioning of a range of other institutions, including the South African Revenue Services (SARS), the Hawks investigating unit and the Independent Police Investigative Directorate have been negatively affected through suspensions and forced resignations, in some cases apparently related to attempts to investigate Nkandla spending and to enforce taxation obligations relating to the African National Congress (ANC) and the President. The Marikana massacre of mine workers was emblematic of the violent period in which we live and the subsequent commission of enquiry was marked, amongst other irregularities, by police doctoring the crime scene by placing weapons next to dead miners and other attacks on the capacity of the commission to uncover the truth. Political violence is obviously the antithesis of democratic politics. Current South African politics is marked by use of force and a significant number of murders. This was evident at the time of the rise of Jacob Zuma to the ANC and state presidencies, when Zwelinzima Vavi and Julius Malema led calls in relation to the hundreds of fraud charges then standing against the president that people should be prepared to ‘kill for Zuma’. The subsequent elections saw extensive violence used against the Congress of the People challenge. Violence and illegality go much further, including attacks and murders of shack dwellers who are often evicted in defiance of court orders, evoking a seeming sense of impunity amongst ANC and local government officials. We have seen in the present period how there have been a significant number of murders of politicians, most of these apparently within the ANC itself, notably in Mpumalanga, KwaZulu-Natal, North West and Limpopo provinces. Many of these killings may relate to the corruption that has become systemic from top to bottom of government with hardly ten per cent of local government institutions attaining a clean audit. The way in which contestation has erupted shows that the lucrative character of office has displaced political questions. The ANC has repeatedly failed to hold electoral conferences in its largest region, eThekwini in KwaZulu-Natal, and since there is no evident political reason for this breakdown the aggressive contestation can be assumed to relate to the spoils of office that will accrue to whoever wins and can dispense benefits to others. The absence of firm rooting within constitutionalism has been one of the reasons why there is such high tolerance of violence. The law of South Africa protects the life and bodily integrity of all who are within the boundaries of our country. That applies to both citizens and foreign migrants, whether or not they are here legally. King Goodwill Zwelithini has not been upbraided for his recent statements inciting attacks on foreigners. Even what he admits to having said and audio clips demonstrate that it entailed xenophobic incitement. Certainly those who committed the attacks or heard their chants understood the king’s remarks that way. Why is he not held to account? He is subject to the constitution and the laws of the land. Why are these not applied? Thus while democratic institutions remain in place they have been consistently undermined and robbed of their meaning in people’s lives. Determined efforts are required, in a rights-based society, to ensure that they recover their capacity. But there are other ambiguities, of a more experiential and also theoretical kind attached to the words 'recovering democracy'. Is our goal to simply go back to 1994 and start over again? Have we not learnt some things since then that we can use to enrich our democratic institutions and practices? At the time of the unbanning of organisations some rights, especially freedom of sexual orientation and gender equality, were neither part of nor firmly within the consciousness of very many people. There are principles related to environmental protection and other issues that may also be strengthened. We are not necessarily speaking, consequently, of simply protecting what we established 20 years ago; we may actually need to augment what is in the constitution. When some people hear the idea of changing the constitution they fear we may open the door for attempts to remove hard-won gains, for example freedom of reproductive rights or abolition of the death penalty. Consequently, part of recovering democracy needs to be concerned with developing a vocabulary and analytical tools that enable us to decide what changes may enhance the quality of our democracy and what may set it back. We cannot say we will never change our constitutional institutions. But we need to be able to say whether any suggested change enriches or impoverishes democratic life, empowers people further or sets their freedom back. That needs to be part of our debate. And that culture of debate, itself, needs to be retrieved. But part of this debate also needs to be over the meanings of democracy. In the 1980s, the popular power period was one of considerable self-empowerment of ordinary people in many parts of the country (as well as some abuses). Those who were part of these developments understood that the future South African democracy would entail the coexistence of popular and representative democracy – the right to vote periodically – with the original meaning of democracy (found with various blemishes in ancient Athens), direct rule by the people in some areas of their life. That fell by the wayside during negotiations but it needs to be retrieved as part of the necessary debate that must accompany the recovering of democracy. Those who queried the word ‘recovering’, suggested instead that 're-imagining' or 'discovering' could better cover what is required now. I am not wedded to any particular word. But we need to understand that the notion of recovering is quite compatible with re-imagining, as indicated by the acknowledgement that we cannot simply go back to 1994 and discovering is part of deciding whether we accept that representative democracy is the only meaning of the word democracy, or whether we can see its coexistence with other democratic manifestations. The main thing in any debate on what type of democracy we have and what we want is that our understandings of freedom and democracy need to be open-ended, for these are qualities of government and popular involvement that can constantly expand. Likewise their scope and existence can contract when they are under attack or threat. One way of defending and advancing our freedom and democracy is to try to make these part of a wide-ranging debate, much needed today. 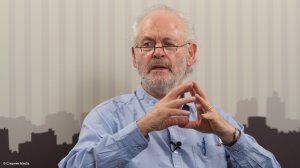 Raymond Suttner is a professor attached to Rhodes University and UNISA. He is a former underground operative and political prisoner. He writes contributions and is interviewed regularly on Creamer Media’s Polity.org.za. He has recently published Recovering Democracy in South Africa (Jacana). Follow Raymond on Twitter: @raymondsuttner.